Yesterday at Wang Lang I bought a small bag of goodies which included some kind of sausage, chopped garlic and shallots, I think palm sugar, a few scuds and a bunch of betel leaves. 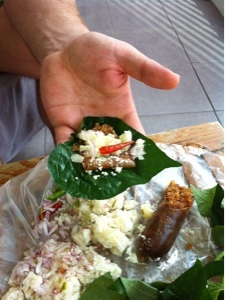 All these goodies are then wrapped up in the betel leaf to make a delicious snack called a Miang that goes perfectly with beer. There's nothing like a few chillies and 30 plus degree heat to heighten the appreciation of a cold beer!